This past week, the Mellow family has been on holiday in the Yorkshire dales. We started our trip with some concern that our two girls, 5 and 2 years old, wouldn't much enjoy walking through countryside but I'm glad to say that they both embraced the great outdoors, made all the more paletable to them through the medium of FOOD! 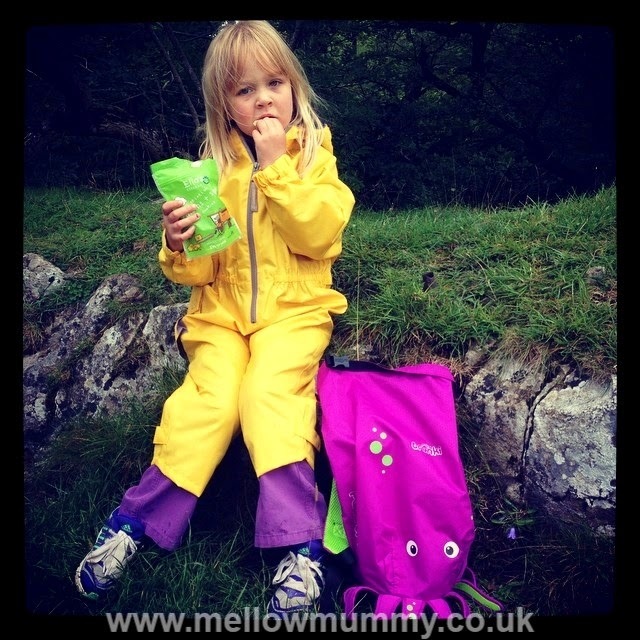 My girls are driven by their stomachs and so we took every opportunity we could to enjoy a family picnic out in the fresh air; Lara loved bringing along a bottle of water and some tasty snacks in her Trunki Paddlepak bag. The Trunki Paddlepak is a water resistant, really light-weight bag for children that comes in lots of fun shapes and colours. Lara's is a purple octopus! Because the Paddlepak is water resistant, it is great for taking out on walks (in the predictable UK rain) and, like us, to visit rivers, lakes and waterfalls (I think it would probably work well by the pool as a beach bag too!). Lara and Holly's Trunki Paddlepak was filled with tasty, healthy snacks for big kids by Ella's Kitchen. Holly single-handedly devoured a tub of "row row row raspberries and bananas multigrain nibbles" while Lara kept going back for more of her "ee i eei oh raisins + spelt cookies" - any excuse for a snack break when you're 5 and climbing up a slippery stoney waterfall trail! I was so impressed with how both girls took to the walking on our holiday - I think Lara clocked up about 40km over the course of the week over fields, through streams, gates and cowpats! We found our Trunki Paddlepak ideal for taking on walks because it gave the girls a little bit of ownership - carrying snacks is a very important job! Lara struggled a bit to keep the bag on her shoulders so I think it would benefit from a little strap across the front but I thought the weight, and the innovative roll-top closure were both excellent; as I'd expect from Trunki. We had a wonderful trip to the Yorkshire dales - it was great to get out and explore! You can find out about more Trunki Travels on their facebook page.